The 75th Governor of Rhode Island, Gina Raimondo, has formed her 13-member transition team and will begin to tackle some of Rhode Island’s big issues once she is sworn into office. On Rhode Island’s To-Do List is, balancing the state’s budget, turning around the high unemployment rate and dealing with the pension overhaul. Rhode Island’s unemployment rate remains a staggering 7.7%, one of the highest in the nation. As of September of this year, nearly 42,000 Rhode Islanders were out of work. Additionally, the Ocean State faces the fiscal year starting in July 2014 with an estimated $149 million in debt.Without a concrete plan for overcoming this budget deficits, it is projected to get worse over time. 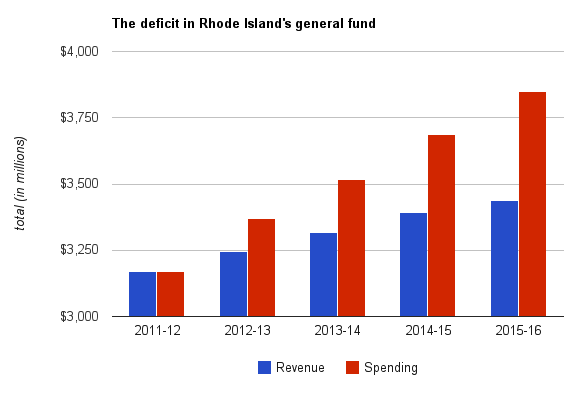 The deficits are due to stunted growth of the Rhode Island economy- state revenue cannot keep up with the increased cost of a myriad of state sponsored programming. The Rhode Island General Assembly has cut over $37 million from the developmentally disabled budget since 2008 in an effort to stop the bleeding. This sparked a public outcry, causing some of the budget for Rhode Island’s most vulnerable citizens to be restored. In order to balance Rhode Island’s budget, there is truly no telling what may or may not be done. In year’s past, Rhode Islander’s have been charged extra to go to the beach, or to own and register a car. Similarly, industries who don’t have powerful lobbyists on their payroll can experience cuts. Rhode Island’s economic struggles may grow in these coming years with Massachusetts stealing some of the R.I. gambling revenue- the state’s third highest source of income. Gambling will experience an expansion in Massachusetts, causing a direct hit for its neighbor, Rhode Island. Additionally, voters selected ‘No’ on Question One, denying the addition of table games at the Newport Grand slots hall. State projections show that the deficit is expected to grow to more than $400 million for the fiscal year starting in July 2017, unless something is done. According to laws, the R.I. General Assembly must balance the budget by the end of the season, but that hasn’t actually been done in well over a decade. Prev Pay to Play Politics in Rhode Island?